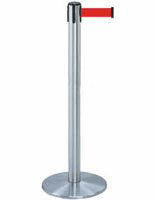 This silver barrier post with gray belt measures 38"H with a 13.5"D weighted base. 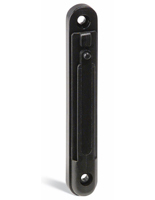 The entire system weighs only 24 lbs., making last minute configuration changes easy. This barrier post with gray belt stretching to 7.5' is a retractable crowd control system. 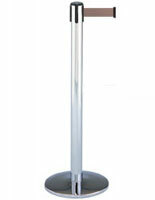 It is recommended these posts, considered the best in the industry, be spaced no more than 7' apart. 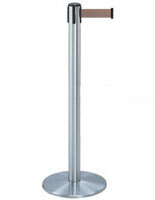 Quality-tested to the highest standards, these stanchions are striking in polished chrome. 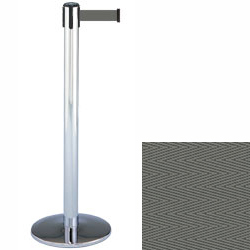 This post with retractable gray belt can be shipped fast - we have the fastest shipping in the country! 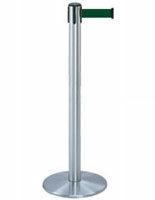 For high-traffic venues, we recommend Dual Belt Posts. Discourage kids from running underneath these systems.Get assistance on layout options from designing crowd control systems. Product does NOT ship on a same day basis. Please add 5 business day(s) when determining the lead time.